Having the right shoulder workout can increase the size of your delts by almost 10% in just 30 days! For most people, shoulders are simply an accessory muscle that they work at the end of their chest day or mix in on another day. I know and watch several people at the gym do a few presses and mix in a few front and side raises and then call it a day. Some of these people work hard when they do their shoulder workout but simply put, treating your caps like an accessory muscle isn’t going to get your the kind of shoulder muscles that turn heads. If you’re a novice at weightlifting, a shoulder workout with the basic exercises, sets and reps will trigger a neurological connection from the brain to the muscle and make the shoulder muscles grow, yes. That can only be done for so long though. The human body is an amazing adaptive machine and performing the basics for more than a few months in the beginning of your fitness journey will get you just that – basic results. If you want a shoulder workout that’s going to force muscle growth and push you past the limit you’re accustomed to, you need to dedicate an entire hour (or slightly more) JUST to your shoulders. Personally, I dedicate an entire day in my workout split just to shoulders. The results speak for themselves. While many people are choosing to perform a rep range of 8-10 or 6-10 reps on their shoulders, we know that in order to force enough blood into the muscle cells to stimulate new growth, we need a rep range that creates an intense pump. I’ve found that rep range to be in the 12-15 rep range and even in the 15-20 rep range for single movement exercises. We’re taking this a step further and incorporating supersets of 15 reps for each exercise for total shoulder annihilation. Depending on your current fitness goals you may want to carb up before this workout. I’ve found that when I’m trying to put on mass (AKA: bulking), that ingesting carbs pre-workout will ensure that there is sufficient glycogen in my muscle cells to provide me with enough energy, strength, and endurance to power through these kinds of intense workouts. This shoulder workout is especially intense and I will typically eat about 50 grams of protein, 80 grams of complex carbs, and 30 grams of high quality fats about 30 minutes before my workout. A good example of this would be one of my favorite, quick meals. This is simply one cup of brown rice, 10 oz of lean ground beef, some chili powder, and some salsa, all mixed together. Once I’ve digested it, I’m off to my shoulder workout. About 2/3 of the way through this workout I can usually feel the onset of fatigue. When I start feeling this way, I’ll sneak a few sips of my post workout shake that’s loaded with simple carbs. Within minutes I feel refueled and ready to tackle the remaining sets and exercises. Don’t drink too much of your shake though. I will typically drink about a quarter of it in small sips throughout the remainder of the workout. I am also very careful to slam the water throughout the workout. I have a 24 oz water bottle that I fill with a mixture of water and one scoop of the Optimum Nutrition BCAA powder. Shake it up and stay hydrated with this. When it’s gone, refill with plain ole’ water from the fountain at the gym. I’ll typically refill at least twice throughout my workout for a total of 72 oz of water during my hour or hour and twenty minute workout. I’ve included links below to all the supplements I mentioned for quick reference. As you may already know, I’m a huge fan of Amazon.com simply because retail stores cannot compete with their pricing. Also, if you have Amazon Prime you get free shipping on most items. Before we dive into the actual workout though, if you are looking for more than just a shoulder workout and want a full program including a nutrition plan then you will want to check out my eBook. 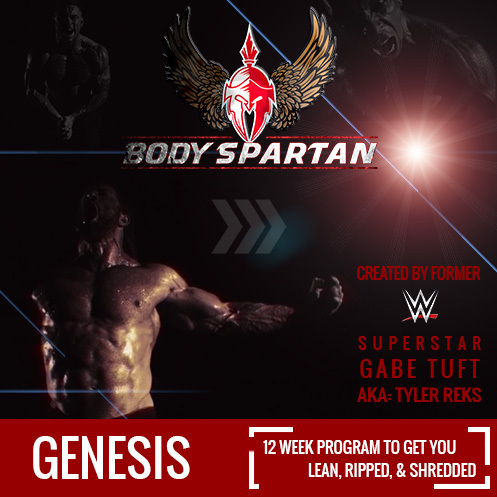 I’ve taken every single one of my secrets and put them in a 12-week program that’s available for download. Follow this shoulder workout to the letter and you’re guaranteed to add serious size to your delts! To ensure the most tension on the shoulder muscle during this exercise, be sure to lower the weights as far as you can (as shown above) and then press the weights straight up, as if they were a barbell, rather than dumbbells. Do not bring the dumbbells together and touch the weights at the top. This takes the stress off of the deltoids and recruits the triceps. Also, by “soft locking” at the top (not fully locking your elbows), you keep maximum tension on the deltoids as well. These two tweaks will ensure you recruit the most muscle fibers possible. It’s very important that you keep a slight bend in the elbows and that the bend does not increase as you raise the bar higher. You want to keep that same angle in your arms throughout the entire range of motion. Also, do not push the bar ups with your hips from the starting position. Rather, contract only your delts to raise the bar. Be sure to focus on contracting the deltoid muscles and not using your back or swinging your body to raise the weights. Try turning your pinkie fingers up during the motion to ensure maximum tension on the side deltoid muscles. For the front raises, raise your arms simultaneously rather than one arm at a time. This will decrease the amount of rest time in between reps and maximize the amount of tension on the front delt. Again, pull only with the front deltoid and focus on simply contracting that muscle and allowing it to raise your arms to about chin to nose high. With the standing cable pull, remember we are working shoulders. To focus on the rear deltoid muscle, try to pull your scapula together and allow that movement to pull your arms backwards to the second position. Keep your elbows flared upwards and do not let them drop out of alignment. Notice in the pictures above that my elbows are directly in line with my entire arm and shoulder and aren’t hanging below. For the behind the neck (BTN) lat pulldowns, I prefer to bend my knees, lean fairly far forward, and point my toes when sitting. This allows me to lock into the seat underneath the leg pads in a very controlled manner. Now, grab the bar at the outermost part and pull it down focusing on contracting your rear delts. Don’t swing your body but rather use a focused and controlled pull. In summary, the most critical elements of this shoulder workout are the rest periods and using proper form. In sticking to the program above and utilizing solid nutrition and supplementation as I’ve outlined, you’re guaranteed to grow – if you put in 100% of your effort. Try this shoulder workout for at least four weeks and post your results in the comments below! Did this workout with my gym buddy last night, and it was absolutely killer!! We are incorporating a lot of your workouts into our routines and both are considering the Genesis program! Sweet Scott! It’s on sale right now too – be a great time to take the plunge! This workout was painful but so rewarding when we finished. My friends and I are 3 days done with the first week of the big arm bible. Killer workouts! All my years in the military and law enforcement, I’ve never done anything like this and that’s a good thing!! Thank you for sharing your professional experiences! So excited to see how we will look and feel when we finish the whole program. Humbled! thank you for your support! Keep up the momentum brother! keep crushing it!